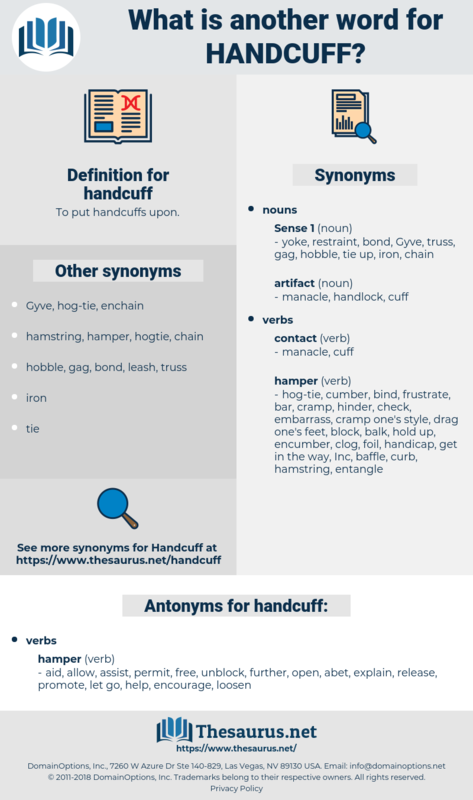 What is another word for handcuff? aid, allow, assist, permit, free, unblock, further, open, abet, explain, release, promote, let go, help, encourage, loosen. He flung off his coat as he spoke, tore off his collar and rumpled his hair, then ordered Riafio to handcuff him. 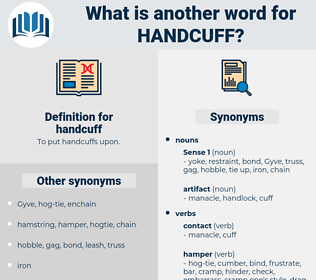 He was sure at first they had come to arrest him for helping the convict, but he was soon relieved, when the officer at their head explained that they were on their way to search the marshes for the escaped men and wanted the blacksmith to mend a broken handcuff.